Mountain Mania is the second level of Autumn Heights, and the tenth overall in Donkey Kong Country: Tropical Freeze. It takes place in a mountainous area, hence the name, and contains several small towers with bells. Donkey Kong and Diddy Kong start in an area similar to the end of Windmill Hills, and soon after, there is a barrel to bring in Dixie Kong as DK's partner. There is also a large stone block with Rambi's symbol on it under the platform, hinting that he may appear later in the level. After the two go through an area with Fluffs and a Cheesy Chester, there will be a crate which the Kongs can open and find Rambi, who can be ridden and used to smash through objects (such as spikes and weak structures), as in Donkey Kong Country Returns. After going through an area with enemies such as Waldoughs, Rambi, DK, and Dixie will go through a series of Barrel Cannons to a similar area where there is a checkpoint and some structures with bells that give bananas when rung. Past these, there will be another checkpoint and a platform which the Rambi and the Kongs can stomp on to reveal a Barrel Cannon that brings them to another large area with several wood bridges, which can be destroyed by volcano fire and enemies such as Cheesy Chesters, Walbricks, and Blue Hootzes. After the third checkpoint, there is a rocky area with the above surface descending and more stone blocks, which must be smashed by Rambi to get through and avoid being crushed by the falling rock. After this, there is a short area with platforms and more stone blocks, and at the end, there is the Slot Machine Barrel. K: Above the four stone blocks. O: Above the swinging box platform on the higher area of the level. N: In between two of the wooden bridges. G: In the rocky area, on the platform with the Cheesy Chesters. After getting Rambi, he can break through the stone block at the start of the level, which reveals a small area where the first Puzzle Piece is. Underneath the Spinning Platform on which the Walbrick near the letter "K" is standing, there is a secret area containing bananas, which must be collected in 30 seconds to receive the second Puzzle Piece. 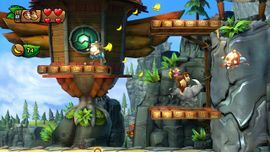 When Rambi and the Kongs jump on either of the two platforms past the small building with the bell, some bananas will appear in the air which must be collected to receive the third Puzzle Piece. The fourth Puzzle Piece appears after the ascending platforms with Fluffs from ringing all three of the bells. Inside the barrel at the very end of the wooden bridge. After the two swinging platforms where the Blue Hootz is, once two nearby Banana Coins have been collected. Inside the barrel found soon after the last Puzzle Piece, there are several bananas which must be collected to receive the final Puzzle Piece. Many bananas can be seen stored in one of the birdhouses in the background after the first checkpoint. This page was last edited on December 18, 2018, at 03:58.